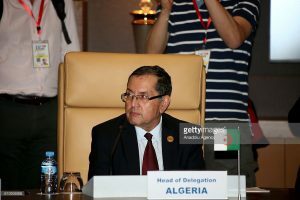 After the High Level Committee of experts of the Organization of Petroleum Exporting Countries (OPEC) failed to reach an agreement on outlining the implementation of cutting the production output in Vienna last month, there were concerns that the Algiers agreement could fail but Algerian Energy Minister Nouredine Bouterfa stressed on Sunday that “there will be no return on the Algiers agreement”. He said the committee is “working on it” and the agreement “has not been called into question.” An OPEC ministerial meeting will be held on November 30 to deliberate on the matter after another expert meeting scheduled to be held a week earlier. Oil prices have been slowly rising after the Algiers agreement in September but the standoff has led to a fall of prices. President James Williams of WTRG, an energy consultant group, said the impasse “is lowering people’s expectations of a future agreement to cut or cap production” as he pointed out that most of the production in the member states of the oil cartel are done by public owned firms. Algeria’s oil and gas refineries have been aging and that has affected its production output. The low hydrocarbon prices have affected its financial situation and it has used its huge foreign reserves to cover its budget deficit while suspending major development projects. Revenue generated from oil and gas provides the lion share of its budget. In its latest effort to boost its production amid the crisis, state owned Sonatrach awarded a $420 million deal to China Petroleum Engineering Construction (CPECC) for the modernization of the Sidi R’cine refinery in Algiers in order to increase its production by 35%. Algeria is planning to build five new refineries to increase its current annual national output of 30 million tons of oil by 50% in five years. With analysts stating that the $100 price for a barrel could be history, an increase in investment to boost output could be the new trend among oil producers to cover their budget expenses despite their efforts to diversify their economies amid the risk of the market being oversupplied. Posted by Peter Mulvany on Nov 7 2016. Filed under Energy, Headlines, World News. You can follow any responses to this entry through the RSS 2.0. Both comments and pings are currently closed.